April 18, 2016 – U.S. Strategic Command (USSTRATCOM) entered into an agreement with the United Arab Emirates Space Agency (UAESA) to share space situational awareness (SSA) services at the 32nd Space Symposium in Colorado Springs, Colorado, on April 11, 2016. The arrangement, which will enhance awareness within the space domain and increase the safety of spaceflight operations, was formalized in a memorandum of understanding that was signed by U.S. Air Force Maj. Gen. Clinton E. Crosier, USSTRATCOM director of plans and policy, and His Excellency, Dr. Khalifa Al Romaithi, the UAESA chairman. 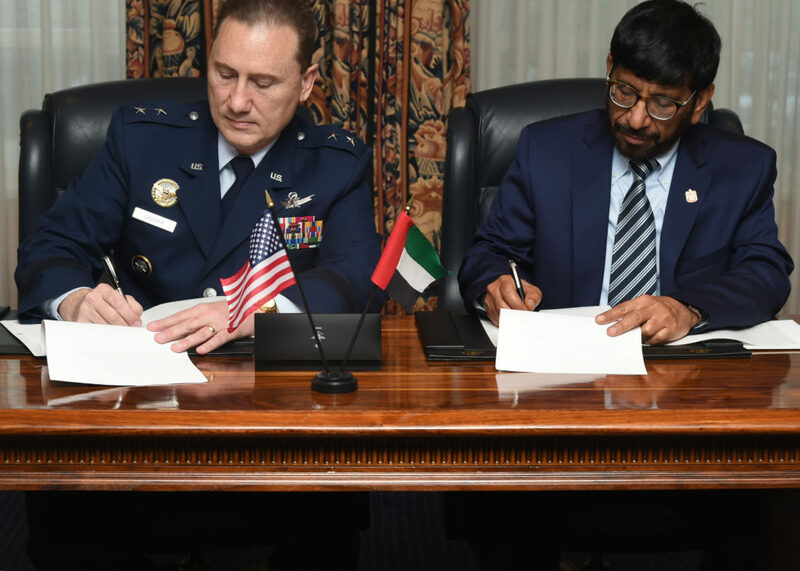 “We are proud to sign this important agreement that further solidifies the bilateral UAE and U.S. space relationship and will contribute to the protection of important assets of both countries in orbit,” said Chairman Al Romaithi. The UAE joins 10 nations – the United Kingdom, the Republic of Korea, France, Canada, Italy, Japan, Israel, Spain, Germany and Australia – two intergovernmental organizations, the European Space Agency and the European Organization for the Exploitation of Meteorological Satellites, and over 50 commercial satellite owner/operator/launchers already participating in SSA data-sharing agreements with USSTRATCOM. SSA data-sharing agreements enhance multinational space cooperation and streamline the process for USSTRATCOM partners to request specific information gathered by USSTRATCOM’s Joint Space Operations Center at Vandenberg Air Force Base in California. The information is crucial for launch support, satellite maneuver planning, support for on-orbit anomalies, electromagnetic interference reporting and investigation, satellite decommissioning activities and on-orbit conjunction assessments.